Prepare yourself for highly thrilling Water Surfer Motorbike Stunts adventure, & perform impossible bike racing of water surfing games on beautifully designed Impossible racing water tracks environment. In this water surfer bike racing game, expertly drive water bike or stunt bike of bike stunt... see more Prepare yourself for highly thrilling Water Surfer Motorbike Stunts adventure, & perform impossible bike racing of water surfing games on beautifully designed Impossible racing water tracks environment. In this water surfer bike racing game, expertly drive water bike or stunt bike of bike stunt games and display best bike stunts or free style water stunts in best bike show. 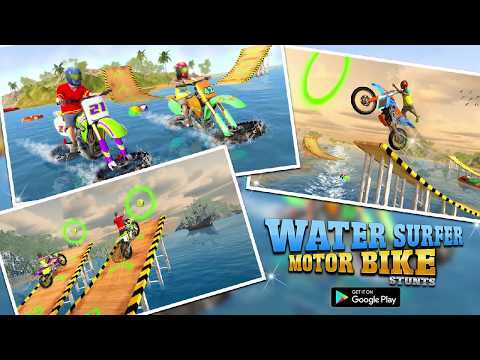 In this Water Surfer Motorbike Stunts adventure, become part of stunt bike racing as extreme motorbike rider or bike racer of 3D riding stunt game pass through different impossible tracks or water racing tracks with floating tube. In this extreme 3D free racing game, expertly utilize bike simulator or floating bike simulator of motorcycle games while displaying best bike stunt with crazy bike stunts from stunt games in water park. Get engaged in Water Surfer Motorbike Stunts adventure & move across various racing water tracks with stunt bike racing to perform impossible bike racing in best bike show in realistic water park. Are you fan of playing stunt racing game or highly engaging bike stunt 3D games then this water surfer game will fulfill your unique requirements. In this extreme 3D free racing game, expertly ride water bike or stunt bike of bike stunt games on various impossible tracks or water racing tracks utilizing highly advanced bike simulator or floating bike simulator of motorcycle racing games. In this water surfer bike racing game, become extreme motorbike rider or bike racer of 3D riding stunt game & get engaged in water park racing. Expertly display best bike stunts or free style water stunts from stunt games to complete each racing game mission on time. - Stunning HD graphics with animations of water park racing games. - High quality sounds & effects from water surfing games. - Smooth controls for movements around the racing arena. - Different competitive levels with real motorcycle physics from best motorcycle games. - Highly addictive motorcycle racing games based play mode.